Hello “Friends”. It’s fall in the valley, and fall on the river. So we are announcing our first “Falling for Autumn” photo challenge. We encourage you to get out and see the beauty of the Mahoning River as the trees that line her shores put on an autumnal fireworks show. Take some pictures and post them on our page Friends of the Mahoning River. 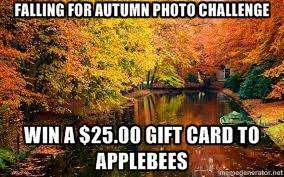 The top two pictures that get the most “Likes” by Friday November 30, at 10:00 p.m will win a $25,00 gift card to Applebee’s that you can pick up at our December 15, 2014 meeting. The meeting will be 6:30 p.m. at the Main Library 305 Wick Ave. Youngstown. Good Luck! And be careful.